This manual covers all the major processes in setting up and using ERPNext. The manual is written in a way that the user can manage a self-implementation of the ERP. We recommend that the manual be read first before starting implementation. 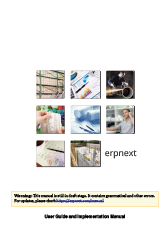 Inventory, Accounting, Manufacturing and Projects using ERPNext. Support and Maintenance and setting up a website from within ERPNext. co-ordinate work with your colleagues. - 5. The final section covers customization and advanced configuration options. improvements to the product and the manual.